If you’re anything like me, you probably have a good stash of old bread waiting somewhere to be used. This is probably the best way to do it. A fantastic dessert, based on bread, vanilla, and cinnamon, is combined with the refreshing lemon spread for the best summer dessert. Combine eggs, sugar, vanilla and rind in a bowl and whisk in the milk. Cut bread into rounds, using a 9 centimetre cutter. Spread each round with the lemon. To make the lemon spread, combine all the ingredients for spread and simmer over a low heat stirring constantly. Allow to cool before spreading each round of bread. To assemble the pudding, place bread rounds in individual oven proof dishes. 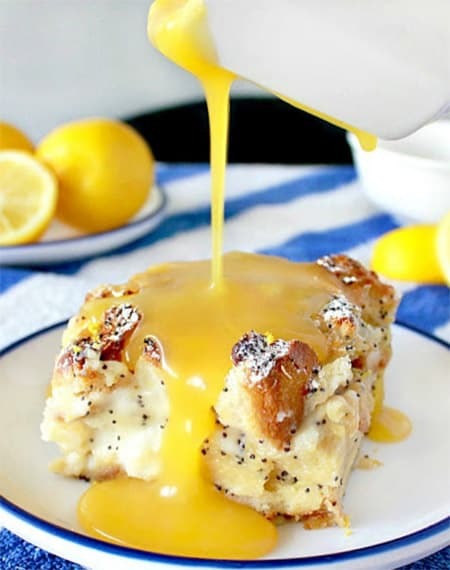 Carefully pour half the custard mix over the bread and let stand for ten minutes. Pour remaining custard mix into the dishes and sprinkle with cinnamon or nutmeg. Place dishes in a baking pan half filled with water. Bake at 180C for 40 minutes or until set.